Willkommen im Moon Inn Kona! Denke "Zuhause weg von Zuhause". Unsere Familie hat eine lange Tradition der Gastfreundschaft, die wir gerne auf Sie ausdehnen würden, wenn Sie die Big Island von Hawaii besuchen. Nach einem 5-6 stündigen Flug nach Hawaii, einem Mietwagen, einem Zwischenhalt im Supermarkt und dem Auspacken sind Sie bereit für eine entspannte Pause auf Ihrer privaten Veranda mit 180-Grad-Blick auf die Keauhou Bay und den Pazifik. Die Sonnenuntergänge sind hervorragend !! Die moderne Schlafzimmer-Suite mit abgeschirmten Veranda, saubere Einrichtung und angrenzenden Büroflächen ist hell und schön. Meeres- und Bergbrisen halten das Schlafzimmer kühl und komfortabel. Gehen Sie Ihre Tür bis zum Ende Ihrer Fahrt, biegen Sie links ab in die Keauhou Bay und Boote oder biegen Sie rechts in das Keauhou Shopping Centre, wo Sie schöne Geschäfte, ein Kino, Longs Drugs, KTA Lebensmittelgeschäft und mehrere Restaurants finden. Wir sind auch neben dem Kona Country Club, wenn Sie Golf mögen. Wenn Sie keine Lust haben, irgendwohin zu gehen, ist der Kona Resort Pool sauber und einladend. Wenn Sie Übernachtungsgäste einladen oder wenn Sie Kinder haben, kann unser Obergeschoss ein Bett bequem unterbringen. Die Küche ist komplett ausgestattet und unser Esstisch bietet Platz für 4 Personen. Mit dem Auto erreichen Sie die Innenstadt von Kona nach 10 km. Alternativ können Sie den Wiki-Wiki-Bus vom Einkaufszentrum Keauhou nehmen. Es ist eine 5-10 Minuten Fahrt zum beliebten Magic Sands oder Childrens Beach zum Schnorcheln und Strandspaß. Natürlich, wenn Sie Heimweh bekommen, hat Kona auch einen Costco, Wal-Mart, Target, Home Depot und Starbucks. Schöne Sonnenuntergänge von Ihrer eigenen Veranda, Ruhige Atmosphäre, Lush reifen Landschaftsbau, Gurren Tauben, Morgen Vogelgezwitscher, 5 min zu Fuß zum schwarzen Sandstrand in Keauhou Bay, 5 min zu Fuß zum Keahou Shopping Center, Schlafzimmer Office-Bereich, privater Parkplatz, Sonnenschein zu genießen! !! Property is very well maintained, flowers are beautiful. Beautiful sunsets. Peaceful space in excellent location. Very nice condo, good kitchen and comfy bed. Plus beach toys and cooler. Would definitely come back. Maholo! 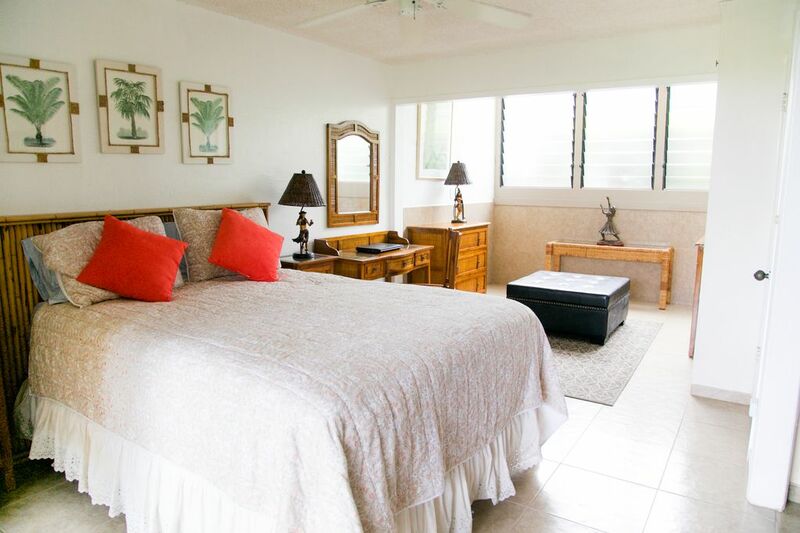 Thank you so much for choosing our MoonInn Hawaii for your home away from home! We enjoyed our stay at Moon Inn. It is a split level townhouse so if stairs are an issue, beware! No A/C but good cross breezes and fans help to cool it down. Gorgeous view and generally quiet setting. The condo is well furnished and supplied. Did have some issue with ants so be sure to put all food away. The pool was great and convenient. It a little out of Kona but we got used to the drive and found some short cuts. Very convenient to food shopping. We had a wonderful time on the island and really didn't want to leave at all! Thanks Roseanna for a great stay! We love this place. An ideal location for reading, resting, swimming. Sleeping on super comfy queen bed.! On alternate days we explored the Big Island from art galleries in Hawi to natural wonders of Volcano and breathtaking South coastlines. Cook at home or try adventurous restaurant meals or take/out?? We stopped to bring home laulau plate lunch on our return from City of Refuge. The walkable Keauhou Shopping Center has all one needs —grocery, pharmacy, movie theater, bookshop, even a neighborhood church—on days we didn’t want to drive. ( It would be fun to catch the trolley to downtown Kailua-Kona). Thanks for the tour books and magazines that point out places to explore. My husband spent teen years swimming/spearing at Hapuna and had never visited the Puako Petroglyphs until this visit. We return to Mainland refreshed!! Thank you for sharing this beautiful place! Wonderful and private townhouse close to a ton of great beaches and food. The hosts were extremely responsive and provided a ton of recommendations that made our trip unforgettable. Highly recommend! Close to Kona, with lots of space. This is a perfect space if you plan to spend most of the day out and about. The townhouse has lots of windows for ventilation, but it does get warm during the day. During our stay, we had breakfast and dinner on the balcony and had all the space needed to prep meals and relax. We spent most of the daylight hours outdoors. Getting too and from Kona or Captain Cook could not be easier. The community is very clean and quiet. The pool(s) are small but perfect for a quick dip after a long day. Kitty Ecke, um Keauhou Shopping Center, Beach-Volleyballplatz, schwarzen Sandstrand, Bucht und Bootsanlegeplatz, in der Nähe von Childrens Strand zum Schnorcheln und Tauchen, Bootsverleih, Kanu fahren oder Paddeln (traditionelle hawaiianische), Luau, Nachtzeit Manta sehen im Sheraton Resort, Kona Golf Country Club, Cliff Jumping am Ende der Welt, Krankenhaus, Lebensmittelgeschäfte, Bauernmärkte, Kirche, Volcano, Mauna Kea Observatory, Sonnenschein !! Tax ID# W09231113-01 This is a wonderful property for your Honeymoon, Anniversary or Special Getaway. 1 week minimum stay (6 nights 7 days). Most Credit Cards are accepted through VRBO Until confirmed, rates are subject to change without notice.